A cloud-native approach to build, manage and continuously update cloud based applications using microservices architecture for Faster Time-to-Market and Improved App Quality. Enterprises must modernize its applications on regular basis to keep-up the pace of change revolving around user-experiences, competitive advantage and quality delivery with highest possible performance. This results in frequent application upgrades with new features and bug fixes. In the wake of this continuous evolution of adapting changes, traditional architecture has been slowly disappearing giving rise to microservices architecture. Giants like Amazon, eBay, Netflix, Twitter and many more are already reaping benefits, having hosted on microservices architecture. Let us have a deeper look at why implementing microservices architecture is rewarding, that too with open-source technologies. VOLANSYS enables customers in migrating to cloud with microservices architecture, quickly using advanced technologies, proven practices, and innovative approaches. We enable global enterprises to develop, deploy, and manage PaaS and SaaS solutions on a variety of cloud platforms including AWS, Bluemix, Rackspace etc. Having collaborated with VOLANSYS, our customers achieves rapid time-to-market with superior quality and better business prospects. Microservices are small, self-contained services that can evolve independently and deploy separately to support continuous integration and continuous delivery. A microservice architecture promotes developing and deploying an application or a set of features composed of independent, autonomous, modular, self-contained units. Each unit is assigned to a team that owns it for improving it. Adoption of microservices, teams can rapidly ship newer versions of applications or features without disrupting rest of the solution. Enables Agile Processes: Moving away from a waterfall-based mindset that views software projects as large, multi-year capital expenditures. Microservices helps enterprises to fully adopt agile development and deployment methods with a strong technology platform that facilitates cloud-native approaches and microservices architecture setup. Leverages Best-fit Technology for Each Component: Developers are choosing best-of-breed languages, frameworks, and tools to write parts of applications. One large application might be composed of microservices written in Node.js, Ruby on Rails, Python, R, and Java. Each microservice can be written in a language that is best suited for the task. Teams that develop microservices can make technology decisions that are right for the job. They can experiment with modern technologies, libraries, languages, and frameworks, yielding faster innovation cycles. Modularity and Code Re-usability: Organizations today invest in reusable building blocks that are composable. 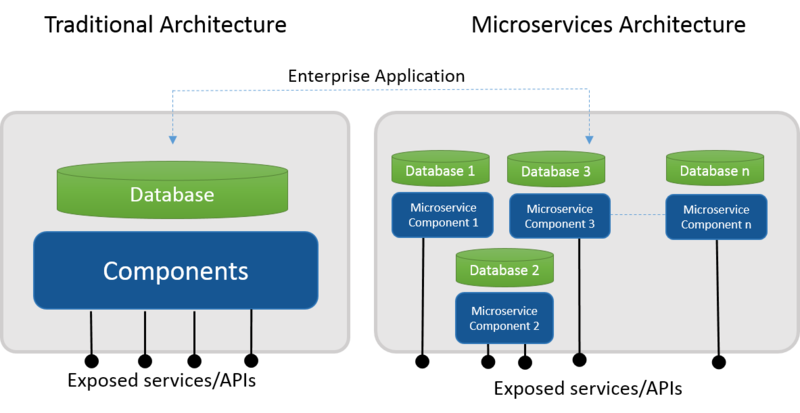 Each microservice acts like a Lego block that can be plugged into an application stack. By investing in a set of core microservices, organizations can assemble them to build applications catering to a variety of use cases. Elastic Infrastructure: With multiple cloud infrastructure providers is available in the market, enterprises today can dynamically provision, configure and orchestrate a few hundred virtual servers. But, instead of launching multiple instances of the application server, it is possible to scale-out a specific microservice on-demand. Microservices simplifies load balancing because when the load shifts to other parts of the application, an earlier microservice will be scaled-in while scaling-out a different microservice. Ease of CICD (Continuous Integration and Continuous Delivery): Microservices helps small, autonomous, co-located teams with test driven development, continuous integration and continuous delivery that make the successful launch of each feature or application. Decentralized Data and Governance: While microservices encourages its developers to save time by always using re-usable code libraries established by others, while also giving them the freedom to flirt with alternative solutions when needed. In addition, a solution with traditional architectures uses a single logical database across different applications. In a microservice, each service built for specific application or feature usually manages its unique database. Reduces Time to Market: As each microservice is built and aligned around a business function to reduce the complexity of the application change-management process. It expedites updating new technologies, libraries, languages, and frameworks, yielding faster development cycles, including rollback. Each service is individually changed, tested, and deployed without affecting other services, enabling faster time to market. Superior Application Quality: By using “divide-and-conquer” approach of microservices architecture, teams can perform both functional and performance testing of each unit easier than before as components can be tested in isolation and combined with a full or virtualized set of microservices. It also minimizes test automation and quality-assurance overhead and facilitate concurrent, A/B release testing on subsystems. Thus, microservices approach results in overall improvement in application quality. Zero-Downtime Deployment: Microservices enables versions and releases planning process and backward compatibility requirements with master and multiple slave containers. It allows you to deploy the latest version of your microservice without interrupting the operation of the other micro-services. Implementing Micro-Services Architecture (PART II): For Building Next-generation Mobile and Web applications on Cloud Environment———Upcoming.